Men’s basketball at what was then Bellevue Community College was the first intercollegiate sport in the history of the college. The men’s basketball program kicked off it’s first season in 1967, led by the leadership of Coach Ernie Woods who held that position until his retirement after the 1996-97 season. 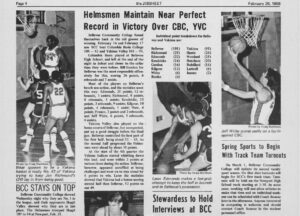 BCC’s first game was played on the road on December 1, 1967 when the Helmsmen beat the University of Washington Junior Varsity (JV) team 79-67. Lee Edmonds scored 21 points in that game and was the leading scorer in 19 of the Helmsmen’s 28 games during that season. BCC finished the season in first place in the Eastern Division of the NWAACC (known then as the WAACC, the Washington Athletic Association of Community Colleges). After league play, Bellevue went on to defeat Tacoma and Clark then beat host Green River in the championship game 89-85 to win the WAACC title in its first-ever season. The Helmsmen’s record in that first season was 23-5. The second year started out as strong as the first with BCC recapturing the Eastern Division crown, only to be eliminated after two games at the WAACC Tournament. BCC then missed qualifying for the tourney in five of the next six seasons as its trips to the final eight in 1973 and 1976 both ended after two games. In the early days, the Helmsmen played their home games at nearby Sammamish High School and Newport High School. The team finally established its own home court in January 1973 when the BCC gymnasium opened. BCC made it to the NWAACC Tournaments three seasons in a row, placing sixth in 1977 and fourth in 1978 before missing the 1979 tourney. After the 1978-79 season, Coach Woods took a sabbatical and left the 1979-80 squad in the capable hands of long-time assistant Bruce Brown. The Helmsmen went on to the semifinals of the 1980 tourney before falling to eventual champion Wenatchee Valley and finishing in third place. Woods returned the following season and led BCC to the league title and sixth place at the NWAACC Tournament. The Helmsmen were eliminated after one game at the 1983 and 1984 tournaments. In 1986, BCC who won the Northern Division title, placed fourth at the NWAACC Tournament. Beginning in 1987, Bellevue hosted the NWAACC Tournament for three consecutive years. After failing to qualify in 1987, the team placed fifth in 1988 and third in 1989. The Helmsmen finished the 1989-90 season as Northern Division champs for the third straight year and were the number one ranked team in the final NWAACC Coaches Poll. After wins against Big Bend and Clackamas, BCC fell flat in the championship game and was crushed by Columbia Basin 109-76. BCC missed the next two NWAACC tournaments before the magical season of 1992-93. In 1992-93, the Helmsmen cruised through league play undefeated and entered the NWAACC Tournament that year (in Skagit Valley) as the No.1- ranked team in the conference. After wins against Walla Walla and Grays Harbor, Bellevue found itself up against division rival Edmonds in the championship game. Down 75-63 with 7:55 remaining, the Helmsmen rallied for a thrilling 89-87 victory. Tournament MVP Willie Thomas sank two free throws with 11 seconds left to tie the contest at 87. At half court, Thomas stole the ball and scored the winning points with five seconds to go to give BCC its first NWAACC title since their first season in 1968. The Helmsmen finished with a 32-1 record with their only setback coming at Clackamas in late December. Four players returned the following season and the Helmsmen qualified for their 16th NWAACC Tournament, but BCC was eliminated in two games. Woods retired as coach after 29 seasons and was replaced by former BCC player Pat Leonard who coached for three seasons before Rick Turner took over as coach of the Helmsmen for the 2000-01 season. Under Turner, the Helmsmen returned to the NWAACC Tournament in 2001-02 after a nine year absence. After losing their first round game against Walla Walla, BCC won three straight over Southwest Oregon, Edmonds and South Puget Sound to earn a 5th place finish. In the 2002-03 season, the Helmsmen advanced to the semifinals of the NWAACC tournament, but lost to eventual runner-up Green River, and finished 6th . Current head coach Jeremy Eggers was hired to replace Turner in August of 2003, after spending one season as an assistant to Paul Graham at Washington State University. Prior to WSU, Eggers was the Head Coach at Bellevue High School for six years, where he guided the Wolverines to six consecutive district playoff appearances. In Eggers’ first season, a hastily assembled team struggled to a 9-18 finish. Since that tumultuous first year, BCC has been a dominant power in the NWAACC’s Northern Region. In 2004-05 the Helmsmen became the Bulldogs, and Eggers’ first true recruiting class paid big dividends. The Bulldogs compiled a 22-9 overall record, including a 12-4 record in the North. They claimed a share of the Region title (tying Peninsula College for the top spot) and advanced to the NWAACC Tournament as a No. 1 seed, before losing in three games. Eggers was voted Northern Region Coach of the Year by his peers in just his second season at the helm. Eggers’ third season brought more wins, as the Bulldogs compiled a 25-7 record (14-2 Northern Region) and advanced to the semifinals of the NWAACC Tournament before falling to eventual champion Highline and finishing in sixth place. Eggers’ commitment to strong defensive play was evident, as BCC led the NWAACC in defensive field goal percentage, allowing just 66 points per game. The 2006-07 season showed more improvement, and cemented BCC as a legitimate contender in the NWAACC. Bellevue reeled off a staggering 28-4 overall record (the second best record in team history), including a 17-game winning streak. The Bulldogs ran away with their third consecutive Northern Region title with a 15-1 record, and Eggers won his second Coach of the Year award. The Bulldogs took their season to the brink, advancing the NWAACC Championship Game before losing a hard-fought contest to No. 1-ranked Clackamas Community College in the final.